Free Shipping Included! 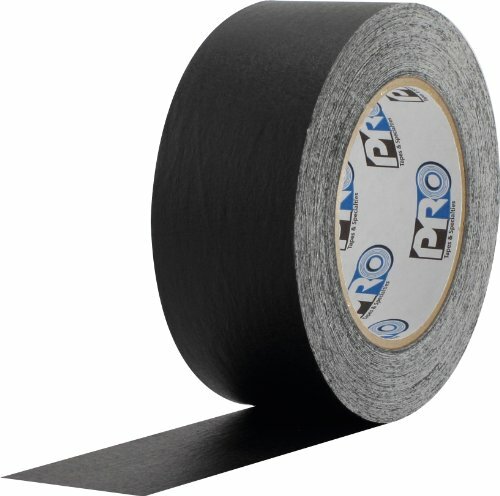 ProTapes Colored Crepe Paper Masking Tape, 60 yds Length x 2'' Width, Black (Pack of 24) by Pro Tapes at Easy Blogging Tip. MPN: Pro-46-6.54-2x60-B. Hurry! Limited time offer. Offer valid only while supplies last. Pro 46 is a rubber based colored crepe paper masking tape used on a wide variety of smooth substrates as a printed or unprinted general purpose tape. Pro 46 is a rubber based colored crepe paper masking tape used on a wide variety of smooth substrates as a printed or unprinted general purpose tape. Pro 46 can be used for packaging, bundling, binding, holding, splicing, banding, labeling, color coding, decorating and identification. Adhesive system designed for excellent performance and adhesion to a variety of smooth substrates. Resists solvents and oil. Premium grade. Printable and flexible. Specifications: ASTM D6123/D6123M-07, Type II. Features: printable, good adhesion short term, high temperature resistance, highly conformable, good solvent resistance, easy unwind. Applicable for packaging, book repair and binding, color coding and labeling, photo edging and cropping, chart tape, splicing, bundling, decorative. Colored crepe paper backing material. Rubber based adhesive material. 23 pounds per inch tensile strength. 9 percent elongation. 40 ounces per inch adhesion to steel. 25 to 150 degrees F maximum temperature range. Measures 60-yards length by 2-inches width by 6.54-mils thickness. Available in black.